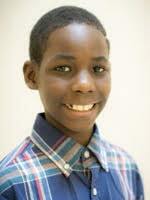 Tirahji is a 10 year old boy that enjoys playing football and basketball. Tirahji has a great sense of humor and loves to make other laugh by telling jokes. When not playing sports or telling jokes, you can find Tirahji swimming, drawing, playing board games or playing with friends outside. Tirahji really enjoys listening to music and having dance battles with his friends. Tirahji can be described as helpful, caring, shy at times and friendly. Tirahji is in the 3rd grade and has expressed that he does not particularly enjoy school, but does like to take part in his science class and recess. The best fit family for Tirahji would be a one or two parent home. He would do best as the only child or with younger children. Tirahji will need a family that is patient and consistent with boundaries and consequences. He will need a dedicated family that is willing to take the time to build a strong and loving bond. For more information about Tirahji, please contact Kayla Huner-Waymire at (602) 930-4628 or via e-mail at khuner-waymire@aask-az.org.